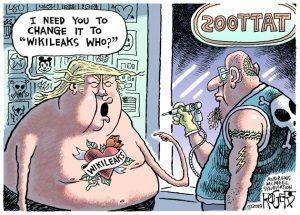 New Book Celebrates the Recent Work and Career Changes of Pittsburgh Editorial Cartoonist, Rob Rogers. Advance copies available HERE. It will be in bookstores in July of 2019. 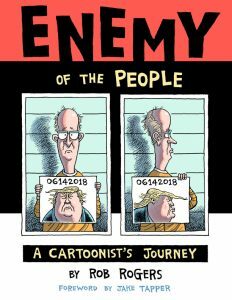 SAN DIEGO, CA (November 8th, 2018) – IDW Publishing is proud to announce Enemy of the People: A Cartoonist’s Journey by Rob Rogers. The title will be released through the IDW: PDX imprint which also prints Full Bleed. 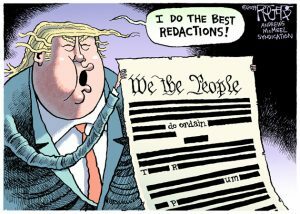 After 25 years as the award-winning editorial cartoonist for the Pittsburgh Post-Gazette, Rogers was fired for drawing cartoons critical of the President. The story of Rogers’ public termination, picked up by the press and shared on social media, captured the public’s imagination. This book chronicles his final weeks at the paper, including an unprecedented six cartoons in a row that were spiked by his publisher. Rogers’ work has been featured in The New York Times, The Washington Post, USA Today, Newsweek and The Week, among many others. His awards include the 1995 National Headliner Award, the 2000 and 2013 Thomas Nast Award from the Overseas Press Club and the 2015 Berryman Award from the National PressFoundation. In 1999 he was a finalist for the Pulitzer Prize. 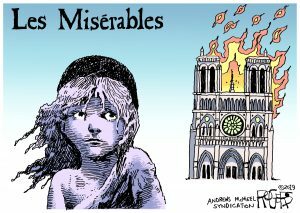 Sometimes controversial yet always thought-provoking, Rogers’ work speaks Truth to Power and challenges conceptions and biases concerning society’s most polarizing issues… as every great political cartoonist must. 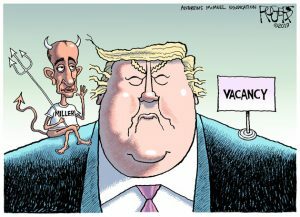 This 184-page collection features highlights of Rogers’ political cartoons over the last three years, his coverage of past presidents, a tutorial on creating editorial cartoons and two long-form comics. The book also includes brief essays contributed by notable cartoonists and journalists championing the First Amendment and lauding the craft of editorial cartooning. 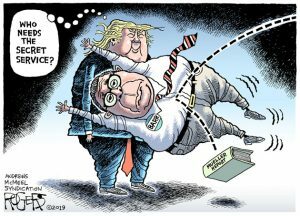 Along with Rogers, several fellow cartoonists, including Pulitzer Prize winners Joel Pett and Ann Telnaes, have provided quotes and context. Jake Tapper, anchor of “The Lead” and “State of the Union” on CNN, as well as a political cartoonist in his own right, provided the Foreword. IDW has announced that Enemy of the People will be in bookstores in July of 2019. A limited advance printing is now available at IDWLimited.com.